What are the advantages of a Pelikan tail compared to a V-tail? The Pelikan tail was originally proposed for the X-32. Why was the Pelikan tail proposed rather than a V-tail? What advantages and disadvantages does the Pelikan tail have compared to a V-tail or a conventional tail? If the vertical part is too close to the wing strake or fuselage chines, the strake vortex could hit the tail surfaces and cause oscillatory loads. The F-18 vertical tails needed to be reinforced so they would not break off. A Pelican tail should easily avoid this. A pure V-tail has poor pitch damping, because the pitch-induced angle of attack change is reduced and the reaction force, too, by the V angle. Placing a horizontal strip in the middle improves pitch damping. Wikipedia has conflicting information on weight savings, but generally V- and Pelican tails should be more efficient than a conventional tail. However, for the best maneuverability a conventional tail is preferable. Again, placing a horizontal part between the two V surfaces improves pitch maneuverability, even when the control surfaces are only on the V part. Their symmetric deflection will induce a considerable lift change on the horizontal part. Placing the vertical tail outside and aft of the engine exhaust will shield the lateral IR radiation better. Higher structural complexity compared to a true V-tail. Lower maneuverability and yaw damping than a conventional tail. 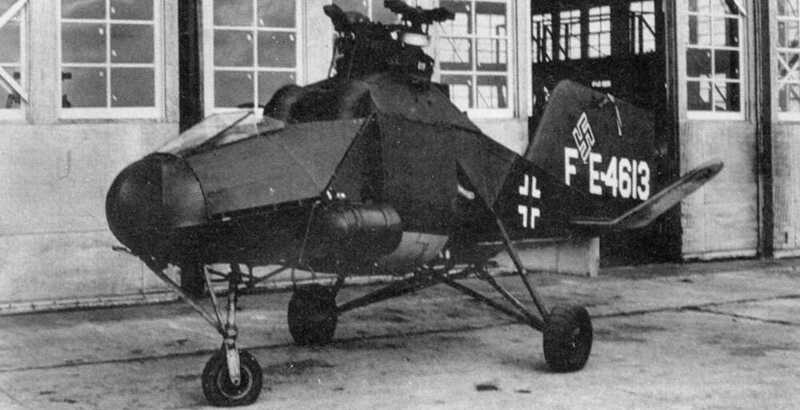 This ist the German Fletter 282 V23 helicopter (picture source), and yes, this is a Pelican tail; however without control surfaces. It had two intermeshing rotors which made a tail rotor unnecessary. Anton Flettner had built the similar Flettner 265 in 1940 and introduced the 282 in 1942. 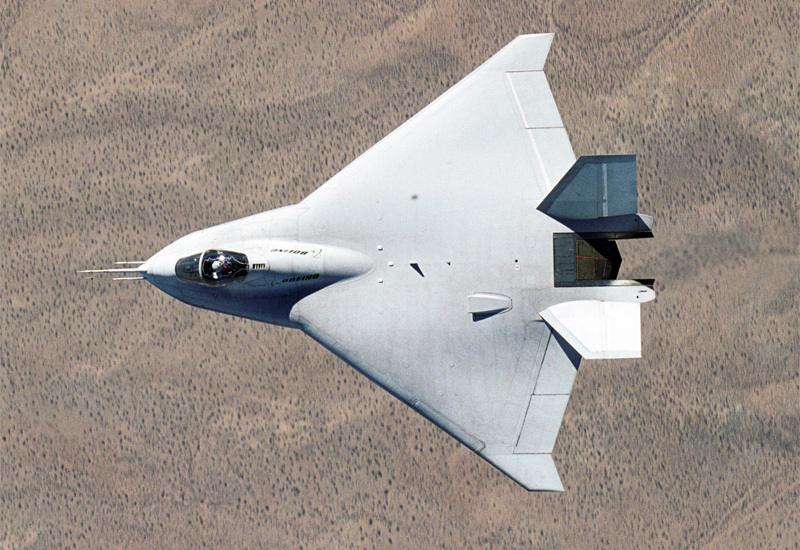 The X-32 was Boeing's entry for the JSF contest, which was supposed to serve USAF, USMC and USN. 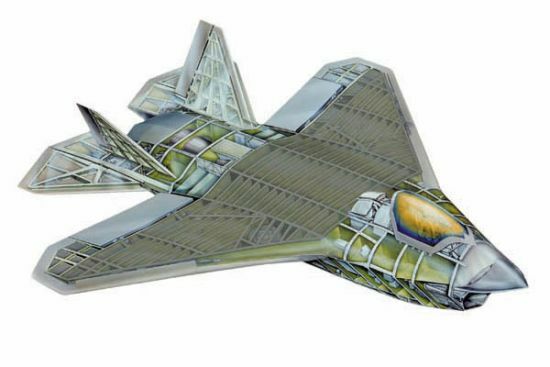 JSF called for an affordable VTOL capable aircraft operated by all three services. Boeing decided to go for a tailless single piece delta with a direct lift system, similar to the Harrier. 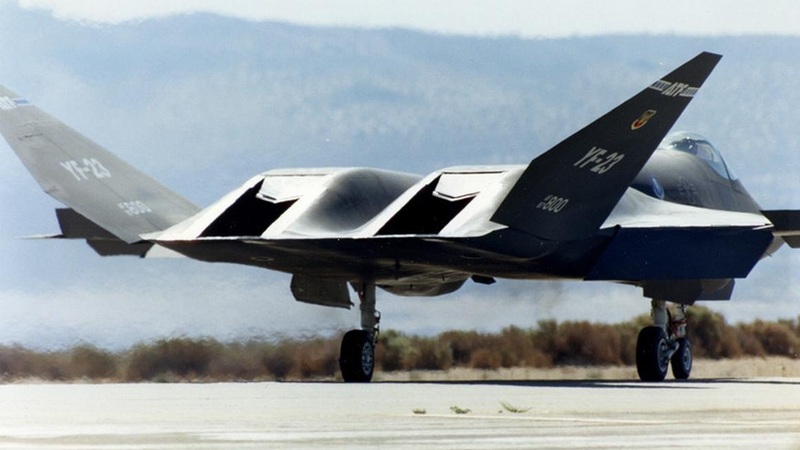 The adoption of direct lift system and other considerations meant that X-32 had weight issues (They actually had to strip off some parts for VTOL). However, midway through the program, USN changed its requirements, requiring improved performance and payload capabilities. This caused serious problems for Boeing as its present design was expected to fall short of the requirements. Offer pitch control at high AoA. It had better stealth characteristics (two tails would be better than four). 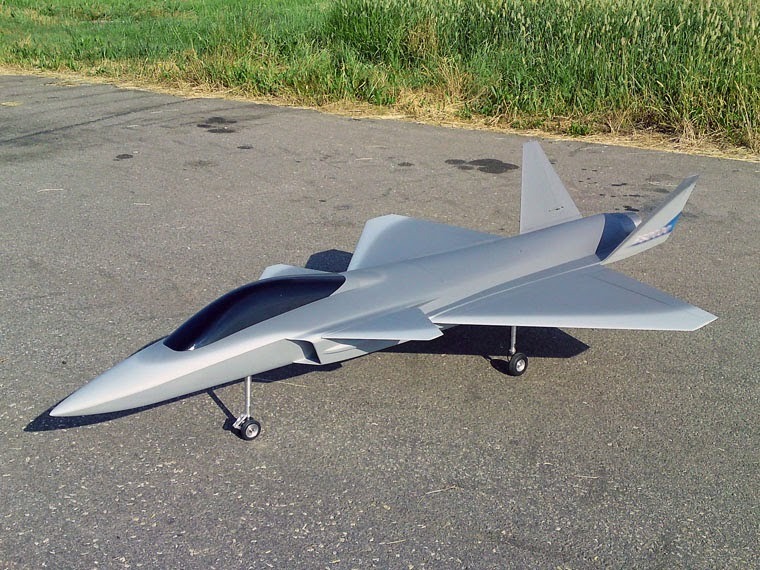 The design would look different from the Lockheed concept. However, the problem was that nobody has flown with this design so far. After some discussion, Boeing decided to go with the Pelikan tail. 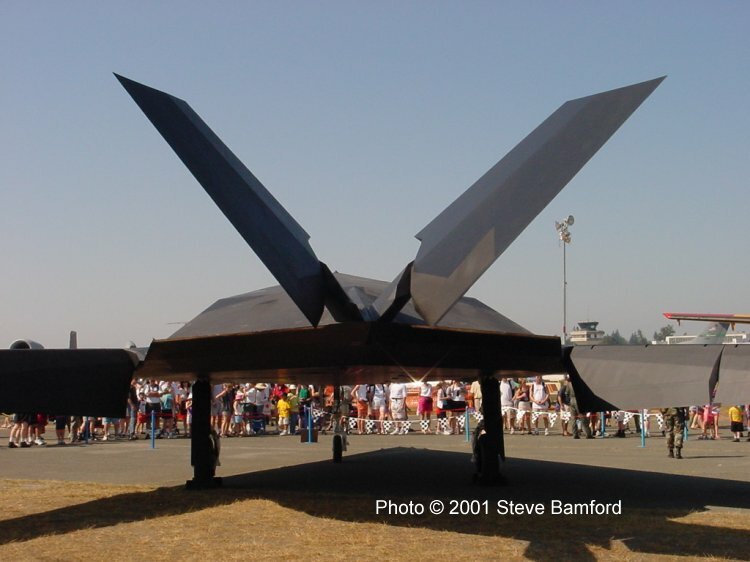 However, after a few days, the decision was reversed as the design was found to be heavier by a considerable amount as the larger control surfaces required beefier hydraulics and Boeing decided to go with a conventional tail, which turned out to be around 1500 lb lighter compared to the original design. Saab is testing a (sub-scale) concept with Pelikan tail called the FS2020, which has Pelikan tail. What is the difference between the V-shape tail and the straight tail on the Beechcraft Bonanza? What are the advantages and disadvantages of an oblique wing over a swing wing? What are the advantages or disadvantages of a mid wing design? What are the aerodynamic advantages and disadvantages of the Weltensegler wing? What are the advantages and disadvantages of autogyro aircraft?